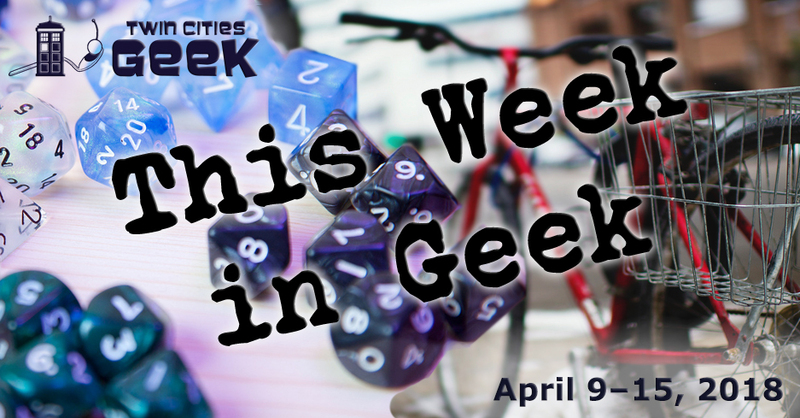 Welcome to This Week in Geek, your guide to events of interest to the Minnesota geek community for the week of Monday, April 9th to Sunday, April 15th. When: Monday, April 9th at 6:30 p.m. When: Tuesday, April 10th at 1:00 p.m.
Get convention ready with this tutorial covering the creation of cosplay armor out of foam with Grace Butkowski and Kristen Cooper. This event will teach the basics, and give some hands-on experience by building your own bracers. This is a free event with materials provided, however space may be limited so preregistering is recommended. When: Tuesday, April 10th at 7:00 p.m.
Come and experience YogaQuest, a blend of yoga and fanfiction storytelling led by certified yoga instructors. Experience a yoga workout experience and a story at the same time. This week’s theme is Star Wars, so feel the Force in your flow! This event costs $15. Enjoy a night of community and tea with Tea and Meeples, a weekly gathering of friendly geeks at Panda Castle in Richfield. This week, enjoy a few more rounds of gaming, and a baked-potato bar for dinner. When: Wednesday, April 11th at 5:00 p.m. The MN Publishing Tweet Up returns for their April event. Come on down to Pryes Brewing Company and check out their private “Barrel Room” space with other writers, readers, and publishing folks. When: Wednesday, April 11th at 6:00 p.m.
Big things have small beginnings, and this Petri Dish event looks at the ways in which researchers might use tiny organisms for big jobs, like disarming pesticides, or clearing out excess nutrients. Come on down for trivia and music, and enjoy the talk starting at 7:00 p.m. Presenters include Mikael Elias, an assistant professor at the University’s College of Biological Sciences, Paige Novak, a professor at the University’s Department of Civil Engineering, and Todd DeJournett, a senior engineer at Geosyntec Consultants. Tickets are $5–10. When: Wednesday, April 11th at 7:00 p.m. When: Thursday, April 12th at 6:00 p.m.
Social Science is the themed “adult night” at the Science Museum of Minnesota, “welcoming those 21 and over to grab a drink, enjoy the museum, and experience innovative programming.” The theme for February is “Cosmos,” and focuses on space exploration to commemorate Yuri Gagarin’s pioneering space flight! Build a satellite, drop a parachute, and learn space communication. Saturday Night Space Opera will be present to teach the basics of space-based tabletop role playing as well. This event is for ages 21 and up, and costs $14.95 for MPR or Science Museum members, and $18.95 for nonmembers. When: Thursday, April 12th at 7:00 p.m.
Nerds of the Twin Cities hosts a monthly evening of informative guest speakers and mingling with other geeks. April’s event will feature three speakers and topics: “The Evolution of Writing from Paper to Displays,” from Mary Pichotta, “To Step into the Picture: Capturing the World Through Photogrammetry,” from Dale Utt, and “The Fast and the Mapped: A Demo of Digital Mapping,” from David Montgomery. This event is free. This regular event at Clockwerks Brewing—hosted by Sam Spadino and Sidney Oxborough—represents the convergence of two geeky favorites: a steampunk-themed bar and absurd trivia. Trivia Against Humanity has also expanded and now has weekly events at Mortimer’s and Glam Doll on Tuesdays and Modist Brewing Company on Wednesdays. See the Trivia Against Humanity Facebook page for additional events, including Rick and Morty Trivia. When: Friday, April 13th at 6:00 p.m. When: Friday, April 13th at 6:30 p.m. The Wright County Geeks host a regular tabletop-gaming meetup focused on role-playing games, like Dungeons & Dragons, steampunk-themed RPGs, and more. This is a fairly informal meetup, and new participants are invited to show up, grab a character (or roll one up), and get into the game. This tabletop-gaming night is a great opportunity to meet other gaming geeks in your area! When: Friday, April 13th at 7:00 p.m. When: Friday, April 13th at 8:30 p.m. When: Friday, April 13th at 10:00 p.m.
Join fellow cosplayers for a social hour at Lush to admire costumes, geek out about costume-making technique, and hang out together in an inclusive and welcoming environment. Attendees who RSVP to the Facebook event will have their cover fee waived. The group will have several tables reserved, so you can hang out with fellow cosplayers, admire their work, and learn from them. When: Saturday, April 14th at 9:00 a.m. Celebrate National Robotics Week at The Works with this day focusing on robots for kids and families! Expect a variety of presenters with fun, kid-friendly demonstrations of real-life robotics principles, agricultural drones (including VR drones-eye-views), Block Bots, Arduino Projects, a prototype prosthetic hand, and more. Presale tickets are $9, or $12 at the door, or this event is free for museum members. When: Saturday, April 14th at 10:00 a.m. Honor the legacy of one of Minnesota’s best and brightest with Prince Day at UROC, a day-long artist-led event honoring Prince Rogers Nelson. This free event includes a variety of family friendly Prince-themed activities, a display of “Love Letters for Prince,” in the gallery, a storytelling event focused on Prince, a conversation focused on his legacy moderated by Robyne Robinson, and a reception. This event is free and open to the public; RSVP via the event link. Comic creators, collectibles, and special guests all come together in Bloomington for the ComicCard Comic Con & Collectibles Show. Check out tons of comics—ranging from modern to the bronze and silver ages—and other collectibles, and see guests like Mike Grell, Amy Chu, Katy Rex, Brent Schoonover, Erik Burnham, Otis Frampton, and Dave Wheeler. This event is $5 for adults, and free for kids under 16. When: Saturday, April 14th at 1:00 p.m. Gender Jam—a meetup group for trans, gender-nonconforming, questioning, and intersex youth—will be meeting up for an afternoon of community and fun. This week Gender Jam will be taking a short field trip to the Midtown Global Market for international shopping and snacking. As always, bring your permission slip if you are under 18. When: Sunday, April 15th at 2:00 p.m. The internet is built on cat-related content, so it’s only natural that your amazing cat should be an Instagram celebrity on its own. This event teaches how to pull that off, as Chris Wlaschin—the human manager of Instagram-celebrity Spot the Cat—discusses photo and video techniques, as well as social media strategy to help propel your cat into the fame it deserves!